New Mercedes-AMG C63 Cabriolet revealed | What Car? The convertible version of the Mercedes-AMG C63 has been revealed at the New York motor show, and will go on sale in the UK this October. The C63 Cabriolet is the convertible version of the Mercedes-AMG C63 saloon, and a rival for the likes of the BMSW M4 Convertible. Like the C63 saloon and coupé, the C63 Cabriolet is based on the latest Mercedes-Benz C-Class, but features a far more aggressive design, more power and tuned suspension, steering and braking systems. 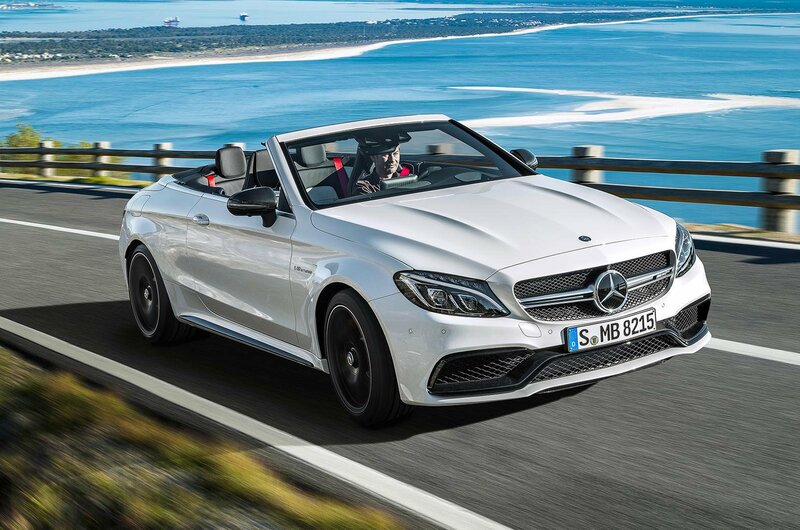 The C63 Cabriolet gets a fully automatic fabric roof, which can be opened or closed at speeds of up to 31mph. The roof is stored under a cover in the boot. With the roof up, the C63 Cabriolet offers 355 litres of storage space in its boot, which shrinks to 270 litres when the roof is down. The open-top C63 will be available with exactly the same engine as the other C63 models - a 4.0-litre twin-turbocharged V8 petrol. It can be had in two states of tune, with the basic C63 getting 469bhp, and the more powerful C63 S receiving 503bhp. The range-topping C63 S can reach 62mph from a standing start in 4.1sec (the regular C63 takes 4.2sec), and both models have a limited top speed of 155mph. Mercedes says that both cars can return a claimed 31.7mpg, with CO2 emissions of 208g/km. There’s only one gearbox option available - a seven-speed automatic with steering-wheel mounted paddles. The cabin of the C63 is based on the regular C-Class, and almost identical to other C63 models. The only major change is the addition of a switch to open and close the roof. In terms of equipment, the C63 Cabriolet comes with AMG’s drive select system, which allows drivers to choose from Comfort, Sport, Sport Plus and Race driving modes. The steering system can also be configured with three separate settings. The options list for the C63 Cabriolet includes a neck heater, and wind deflector, while buyers can also opt for a different roof, which is said to reduce road noise. Mercedes-Benz has yet to reveal official pricing for the C63 Cabriolet, but we understand that the entry-level C63 will cost around £66,000 in the UK, rising to around £72,000 for the C63 S. By comparison, the C63 saloon is priced from £60,060. The C63 Cabriolet’s main rival is BMW’s M4 convertible, which put on an impressive display when we tested it in 2014, despite not feeling as good to drive as the regular M4. Other rivals include Audi’s RS5 Cabriolet.